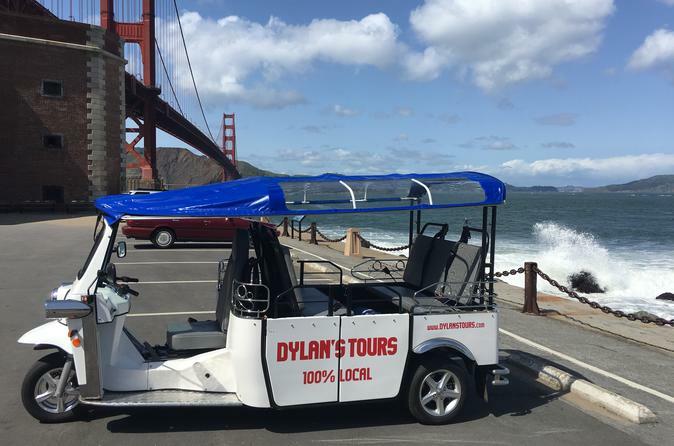 Take a ride around San Francisco on our Electric Tuk-Tuks! Our electric rickshaws are the ideal way to explore the city for young families, couples, groups of friends and small groups looking for a great time. CARRIES UP TO 6 PASSENGERS! 3-hour tour departs at 9:00am and 1pm daily. 6 photo stops including Lombard Street, Coit Tower, Golden Gate Bridge, Pacific Heights and Palace of Fine Arts. Explore North Beach (Little Italy), The Mission, Castro, City Hall, Chinatown and more! Electric Tuk-Tuks (E-Tuks) are auto rickshaws often seen in Asia. These 100% eco-friendly vehicles are one-of-a-kind in San Francisco. Our chic, modern-day versions of the rickshaw are fun, safe and are great for getting up San Francisco's iconic hills. We’ll meet you outside of your hotel or AirBnB at your chosen tour time, where we’ll board the E-Tuk and travel to our first stop. At the conclusion of the ride we’ll head back to the starting point and provide a list of restaurants and museums for the remainder of your stay. Nicknamed "The crookedest street in the world" - one of San Francisco's most popular landmarks - **during busy months, traffic may prevent us from going down. Inspired by Roman and Greek architecture, the Palace of Fine Arts was originally constructed to celebrate San Francisco's recovery from the 1906 earthquake. Voted as one of the USA's "ten great neighborhoods", North Beach is best known as the home of Little Italy. Delicious restaurants to authentic sidewalk cafes abound. One of the first gay neighborhoods in the United States. Colorful bars and restaurants line the streets, with the historic Castro Theater overlooking the area that Harvey Milk once called home.